Old Pulteney. Sounds like something the neighborhood kids might say. Okay, so maybe that’s a little too far with this whisky, but I would say that in some respects, I actually do treat this bottle a little like that crazy old man. When I’m going from bottle to bottle, like the house with the lights off at Halloween, I usually skip this one. It’s not that the whisky is distinctly bad, it’s just that like the house with no lights on at Halloween, in my opinion, it doesn’t necessarily have anything to offer. The nose is almost weightless. What I mean is that it takes a little extra swirling to get the scent above the dram’s rim. And when it does finally rise, it is light and dry, with fleeting hints of what smells like freshly cut grass. Now, I like that smell. It reminds me of summer and a job well done, but when it is mixed with the saltiness Old Pulteney seems to carry as well, it becomes less inviting. The palate is a bit better in that it offers a slighter bit of honey to cut the salt, but it is so slight, it’s almost difficult to discern. The finish, well, it goes well with unsalted popcorn. It provides the oily butter and the sea salt. All you need to complete the picture is a good movie about a crazy old man living in a scary house snatching children. Okay, so again, maybe I’m being too harsh. 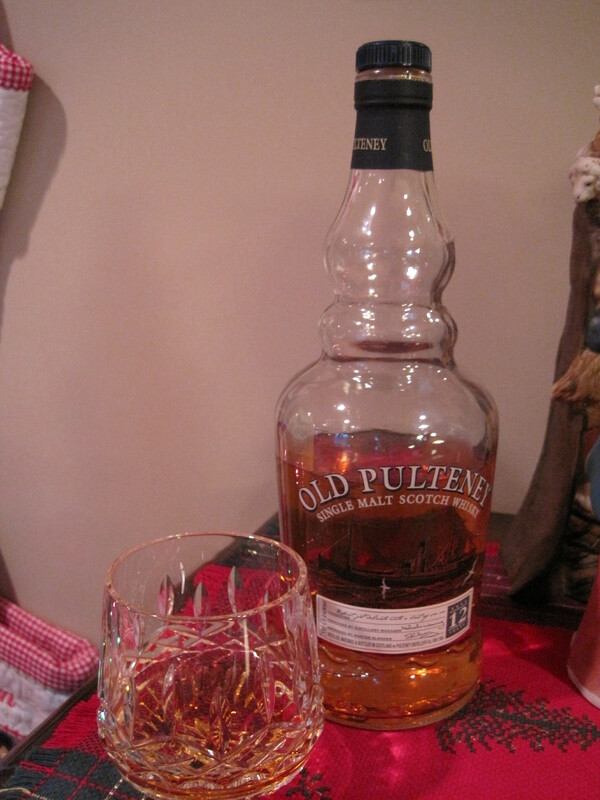 The Old Pulteney 12 year old edition is a light Scotch whisky with regional character. And though I would not go for it post meal, I might try it during a meal — perhaps with beef or fish, but I wouldn’t order it up in public. I would probably place my order in hiding from the bushes. Thank you, kindly. Thanks for stopping by. I shall be off to your blog shortly for a visit as well.